On 24 July 1927 the Menin Gate Memorial to the Missing was inaugurated by Field Marshal Lord Plumer. Situated in Ypres, Belgium, the memorial is dedicated to British and Commonwealth soldiers killed in the Ypres Salient of World War I and whose graves are unknown. The site was selected as hundreds of thousands of men would have passed through it on their way to the battlefields during the war. 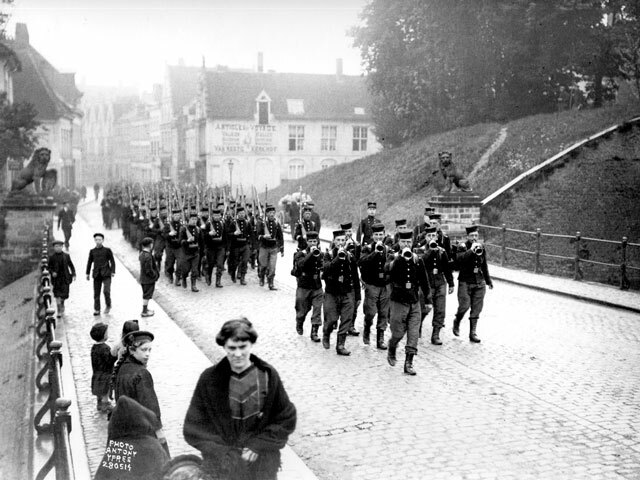 The photograph below shows Belgian soldiers marching through Menin Gate in May of 1914. At that point the ‘gate’ was a gap in the 17th century defensive ramparts of the town. If you are interested in reading about the battles on the Ypres Salient take a look at Campaign 58: First Ypres 1914 and Campaign 225: Messines 1917. For more books on the First World War take head to the store.